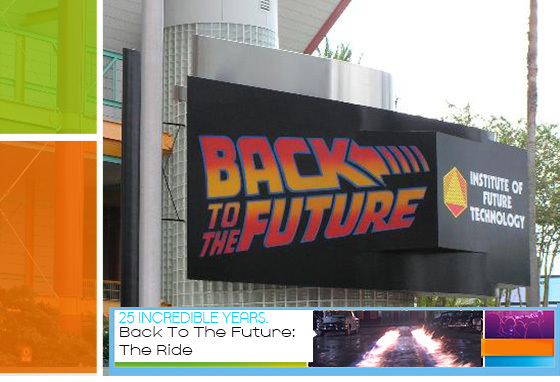 Back To The Future: The Ride opened at Universal Studios Florida in 1991. The ride was a motion simulator, with a 70-foot IMAX screen in front of the guests. The ride had two theaters, each consisting of 12 cars. Sometime after Back To The Future part 3, Doc opened a new scientific lab based off of future technology. Guests entered Doc Brown’s Institute Of Future Technology as volunteers to test out his new 8 passenger DeLorean time machine. Guests entered the first room of the attraction, and Doc Brown tells them that they’re going to go one day into the future, but they need to be cautious because Biff Tannen is running loose in the space-time continuum. Without Doc knowing, Biff has snuck into Doc’s institute. Biff finds Doc and locks him in a storage closet! Biff then proceeds to steal one of the time machines. Doc needs the guests help, he needs them to get into the 8 passenger time machine, chase Biff, then bump him back to the future at 88 MPH! Guests board the eight passenger car, and Doc appears on a screen on the dashboard and tells the guests he will be using his remote control to control the car. The ride starts, and the guests are sent into 2015! They see Biff, and they chase him through time. The guests encounter dinosaurs, and the ice age. Eventually they catch up behind Biff and accelerate to 88 miles per hour, and they successfully bump him straight back to the Institute! “At Future, I did pretty much everything from loading, ran the tower to crowd control. A typical day- came in did platform checks, socialized with co workers, begged to get out of working the baby swap area on level 1 ( level 2 n 3 were my favorites), the park would open and off we went, at the end of the day we would usually head over to Ale House. Back To The Future: The Ride later closed in 2007, and was replaced by the Simpsons Ride. As Doc Brown said, “Remember! The Future Is What You Make It!”.